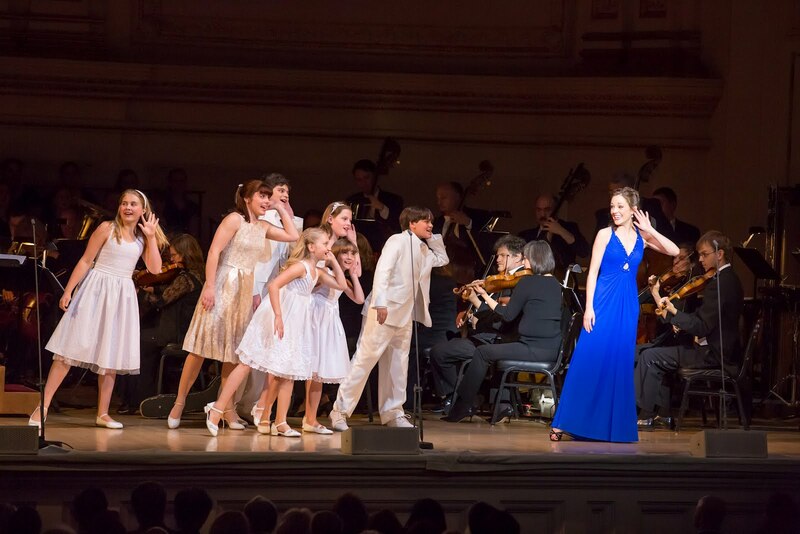 Rodgers & Hammerstein’s extraordinarily popular musical – and their last together – was given a splendiferous semi-staged concert performance at Carnegie Hall on Tuesday night. Backed by the large forces of the Orchestra of St. Luke’s with the good sisters of postulant Maria’s convent comprised of the Women of the Mansfield University Concert Choir, the cast was led by R&H’s girl of the moment, Laura Osnes, essaying her third major R&H show in New York (the Lincoln Center “South Pacific” and Encores “Pipe Dream” being the first two, and the title role in a Broadway revival of “Cinderella” soon to come), was the irrepressible singing novice, Tony Goldwyn the stern former sea captain Georg von Trapp, the Met’s Stephanie Blythe the Mother Abbess, with Brook Shields and Patrick Page as the Baron’s sophisticated cronies Elsa and Max. The Stern Auditorium was utilized to the max, with the nuns making their solemn entrance down the aisles holding votive candles with further groupings positioned in the balcony boxes, all producing a heavenly sound. Throughout the evening, panoramic projections on the back wall lent the proceedings a particularly cinematic look, no doubt in homage to the record-breaking Julie Andrews film which clinched the musical’s enduring fame. Director Gary Griffin moved things along nicely. Encores’ adapter David Ives’ did similar honors here, deftly trimming the book. Paul Tazewell was credited as costume consultant but the cast’s attire was mostly only suggestive of the period and the characters. 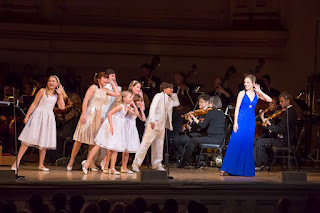 Still, Osnes’ lovely blue gown in the first half was hardly the simple frock you’d expect from Maria, but she looked lovely and sang flawlessly in the ingenue – as opposed to seasoned leading lady (e.g. Mary Martin, Julie Andrews)-- mode. Shields was well cast (and got a big closing hand) as the gold-digging “other woman,” if rather overparted vocally in her two numbers. Page was right on target as the ambitious manager who hopes to get the von Trapp children under contract, despite the Captain’s reservations. Blythe was an imposing presence, physically and vocally, down to earth in her dialogue, and her “Climb Ev’ry Mountain” was predictably showstopping, even if not quite sustaining the final bars of that soul-stirring anthem. Nick Spangler gave a satisfyingly firm account of “Sixteen Going on Seventeen” and his dance with Mary Michael Patterson’s Liesl was quite charming. It was good to hear the original dance music, different from that used in the film. 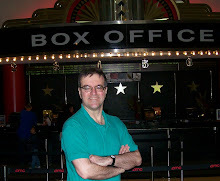 Joshua Bergasse supplied the nice choreography including a particularly sweet Laendler for Maria and the Captain. “The Sound of Music,” hit though it was, is always considered something of a poor relation to the classics “Oklahoma,” “Carousel,” “South Pacific” and “The King and I,” and yet as stage revivals (Rebecca Luker on Broadway, Petula Clark and Connie Fisher in London) have demonstrated, the piece is solidly constructed (thanks to Howard Lindsay and Russel Crouse’s book), and contains one of the team’s most appealing scores. Rodgers’ liturgical music – the lengthy and somber opening, the wedding Processional – is quite magnificent, and the story tugs at the heart. The score as heard Tuesday was essentially the stage version, which seemed to puzzle some in the audience, weaned on the movie. Thus “My Favorite Things” was a duet for Maria and Mother Abbess (affording Blythe a nice light moment), “The Lonely Goatherd” came during the thunderstorm, and “Do-Re-Mi,” mere moments after Maria is introduced to the children. The duet for Maria and the Captain used was the movie’s “Something Good,” as “An Ordinary Couple” would have been redundant. It seems to take London productions longer and longer to cross the pond. I thought the revival of Schiller’s “Mary Stuart” on Broadway after a four year lag from the West End broke some kind of record. But it’s taken the Andrew Lloyd Webber-Tim Rice classic a full six years to make the transition with its star Elena Roger and creative team intact. In London, I admired Michael Grandage’s production very much indeed – ditto, its star – without being quite over the moon about it as I was after seeing the original production there way back when. In fact, much as Patti LuPone’s name has been admiringly dropped in reviews of the present revival, it is Elaine Paige who will ever remain the champ in my memory. She was simply stunning vocally and dramatically, and contributed greatly to making that original production a very hot ticket indeed. It was only Actors Equity restrictions that prevented her from recreating the role here. Roger is, like the ambitious Eva Peron she portrays, Argentinean, and thus brings to the table a unique authenticity. She is also a very fine actress, accomplished dancer, and artful – if not powerful – singer. One must approach her performance much as, I would imagine, audiences in the 1930s might have responded to some heralded European star like, say, France’s Yvonne Printemps, not quite in the Broadway mold. Her voice thins out on top, and some of the showstopping moments of “A New Argentina” and “Rainbow High” are, as a result, less than thrilling. But in every other respect, she completely inhabits the role, and gives a finely detailed performance, particularly in the second act, where she limns Eva’s health decline most movingly. 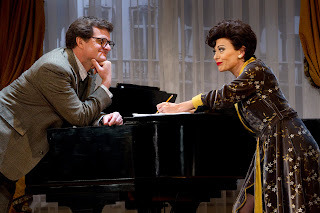 She is superbly partnered here by Michael Cerveris who, as Juan Peron gives a surprisingly textured portrayal for such a sketchily written sung-through role. There’s as much nuance here as in his Sweeney Todd, to cite one of his outstanding characterizations. Max Von Essen also delivers the vocal goods in Magaldi’s “On This Night of a Thousand Stars,” and Rachel Potter sings Peron’s mistress’s cast-off lament very nicely indeed. Rob Ashford’s choreography is stunning, starting with the “Buenos Aires” number which builds and builds with Roger the impressive centerpiece. 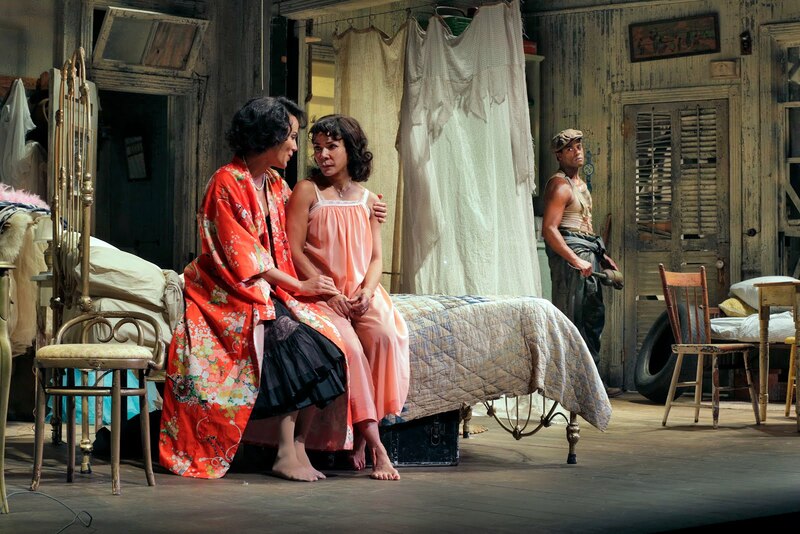 But this production is packed with dancing, all of it top-notch. Hal Prince’s original staging was, one might have thought, definitive, but Grandage’s completely different take against Christopher Oram’s gorgeous realistic sets, is just as satisfying. 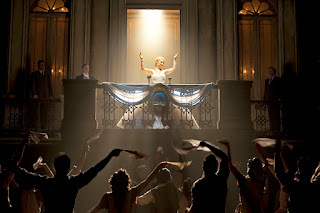 The big “Don’t Cry For Me Argentina” number is beautifully staged, as Eva comes out on her balcony against the golden glow of a chandelier bedecked chamber behind her, and sings pointedly to the adoring crowd -- frozen in tableau -- below. At this moment and the other "public" moments of the show, Roger seems uncannily like her subject. And for all the sophistication of Lloyd Webber's latter-day shows, Grandage's production proves that the energy and vitality of "Evita" are as potent as ever. An all-star cast brightens Gore Vidal’s entertaining and still highly relevant political drama about a nominating convention, circa 1960, wherein a highly principled liberal and former secretary of state William Russell (John Larroquette) stands against a ruthless conservative senator Joseph Cantwell (Eric McCormack, appropriately hateful). The former U.S. president Hockstader (James Earl Jones, relishing every scene-stealing moment) keeps both candidates guessing as to which one he’ll support. Cantwell is not above mud slinging, especially when he uncovers a mental breakdown in Russell’s past, not to mention a history of serial womanizing. But Russell’s campaign manager (Michael McKean) discovers something potentially more damaging in Cantwell’s past. Will Russell overcome his scruples to use the information to defuse Cantwell’s impending attack? Therein lays the conflict of Vidal’s play which clearly has amazingly resonant present-day parallels as Cantwell’s loudly proclaimed self-righteousness echoes precisely the rhetoric of so many of today’s right-wing candidates. 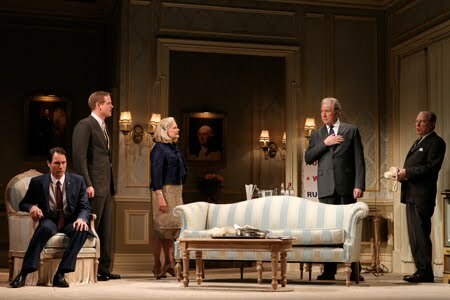 Performances are all fine, including Angela Lansbury (sharp as ever) as the Chairman of the Women’s Division, a matronly Candice Bergen as Russell’s unhappy, sardonic wife, Jefferson Mayes as a quivering milquetoast from Cantwell’s past, Corey Brill as Cantwell’s slick campaign manager, and Dakin Matthews as a gregarious senator. Kerry Butler is entertaining as Cantwell’s Southern belle wife, though her accent is marred by an anachronistic Valley Girl intonation. Derek McLane’s double turntable set allows for speedy transitions between the Russell and Cantwell hotel suites and convention floor, and the colorful campaign banners extending beyond the proscenium and to the boxes. Ann Roth’s period costumes are right on the money. Michael Wilson directs the three-act piece at an engrossing pace.